My husband Tim is a photojournalist so we’re always thinking about how to best document our travels. He’s a big fan of GoPro cameras and filmed this great underwater video when we went snorkeling in Mexico last summer (on a cool trip arranged by my Trusted Travel Expert for diving, Meg Austin). This story by Yahoo! Travel’s Brittany Jones Cooper is a good introduction to using the GoPro equipment, which is sure to help you capture some extraordinary memories. For me, capturing memories on vacation is essential. And while your smartphones can capture a lot, you need a camera that can really travel with you…and for that reason, I am officially a GoPro addict. These little cameras are waterproof, damage-proof, and can be mounted to pretty much anything. An added bonus is that the camera shoots in fisheye (very wide-angle) mode, so you can capture everything. And while it only has three buttons, I encounter a lot of people who get a little intimidated when it comes to using their GoPros. So,in today’s Travel Hacks, I’m going to share three easy ways to step up your travel game using a GoPro camera. But first, let’s review the buttons. On the front, you have your power button, which you hold down to turn the GoPro on and off. You also use this button to toggle between modes, such as video and photo. On the side is the settings button. You can use this to adjust the settings within the different shooting modes. Also, if you hold it down for three seconds, it turns on your GoPro’s Wi-Fi. And finally, we have the button on top, which is the shutter. You use it to take photos or start and stop video recording. The video and photo settings are very easy to use. You simply press the shutter button on the top to start and stop recording or to snap a photo. There is also a Multishot mode that allows you to effortlessly capture a ton of photos at one time. I’m a big fan of the Time Lapse Mode, which automatically takes a photo at an interval chosen by you. 1. Click the mode button until you see Multishot. 2. Use the top shutter button to scroll through until you see Time Lapse. 3. Push the mode button again, which will take you to the second line, where you’ll select your timing. 4. Use the shutter button to select how often you want to take a photo…every .5 seconds, every second, up to every 60 seconds. 6. Press the shutter button to start recording photos. As you go about your action, your GoPro is taking a photo every second. This is the mode many athletes use when they capture those awesome once-in-a-lifetime shots. There are dozens of great mounts, and if you ski, surf, or bike, you should definitely look into purchasing mounts for those specific activities. But if you’re just starting out, there are three mounts I really recommend. The first is the Handler. I love this one because it’s perfect if you’re shooting in or out of the water. It’s light and easy to pack and it floats…so you don’t have to worry about losing your GoPro in the water. The second must-have accessory is the 3-Way. Like the Handler, you can use this to take a selfie or capture a great photo. It also extends if you need to capture more of a scene or get a sense of distance in your photos. And it has this cool tripod that you can use to take stationary shots. I took this awesome photo from the top of Table Mountain in South Africa using my GoPro on the Time Lapse Mode while using the 3-Way tripod. The GoPro app is literally a game changer. Setup takes a few minutes, and the instructions are easy to follow. 2. Press the “Add a New Camera” button. 4. Press and hold the Settings button on the left-hand side of the camera until Wi-Fi Mode appears on the screen. 5. Press the mode button to scroll down to “GoPro App” and press the Select button. 6. Press the “Continue” button in the app. 7. Select your camera from the list (e.g., GP245###…). 9. Create a new camera name and password. 10. You should now see and be able to control the camera to which your phone or tablet is connected. For more instructions, visit GoPro. After your camera is set up, simply hold down the Settings button on the side for three seconds until a blue light starts flashing … that’s your Wi-Fi and allows your phone and GoPro to connect. 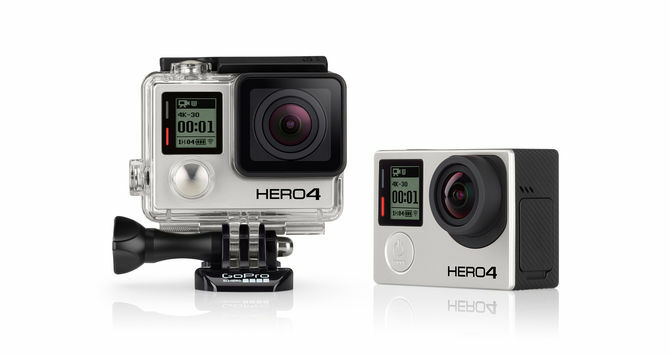 The coolest part is that you can view and play back photos and videos that you captured on your GoPro. This means that after you take a great photo, you can look at it, save it to your phone, and upload it to Instagram or Facebook within seconds. And just when you didn’t think it could get any cooler, you can use the app to see a live feed of what you’re viewing. So, if you mount your camera somewhere out of reach, you can use the app to make sure that the image you want in your photo or video is in the frame. How cool is that?! There are a lot of great things you can do, but that was just a quick beginner’s guide to how to use your GoPro. If you have any questions, contact me on Twitter or leave them in the comments section below. And if you take any awesome GoPro pictures that you want to share, just tag @yahootravel! I’d love to see them. Hi! Thanks for your awesome go-pro tips. I actually wanted to buy a beginner’s go-pro for my husband (who enjoys photography a lot as a hobby) for our anniversary but wasn’t really sure where to start! I wanted to buy a relatively affordable one right now for him to play around with – which one would you recommend?